Europa Selon les Auth. les plus Modernes. 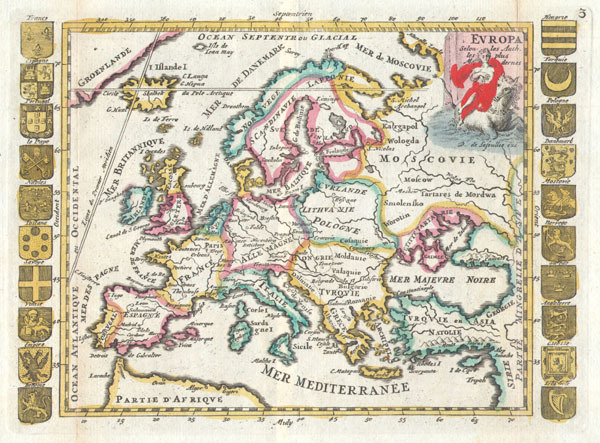 A very scarce, c. 1706, example of a map of Europe first issued by Daniel de La Feuille in 1702. Features the continent of Europe as far west as Greenland (Groenlande) and as far east as the Black Sea and Asia Minor. Extends north to include Lapland and the norther extreme of Norway. Extends south past the straits of Gibraltar to includes parts of Algeria and Cyprus and Syria. Bounded on either side by twenty armorial shields of various European Powers. The curious allegorical title cartouche in the upper right eft quadrant features the goddess Europa riding Zeus in his aspect as an aquatic bull.. This map was originally prepared for inclusion as chart no. 3 in the 1706 edition of De la Feuille's Atlas Portatif. Very Good condition. Minor discoloration along the original folds – see photo. Minor fold separation limited to wide marginal region. Original plate-mark visible. Else clean and beautiful.